Can an Artifact Enchantment - Equipment Aura enchant and be equipped to two different creatures? (1)(Green): Move a +1/+1 counter from target creature onto another target creature with the same controller. (1)(Blue): Attach target Aura enchanting a permanent to another permanent with the same controller. Assuming I control both Song of the Dryads and the permanent it enchants, can I use Simic Guildmage to make song enchant itself? Good to see you here, hkhssweiss and thank you for the ideas. You're definitely onto something in most, if not all, cases. I still have trouble considering taking some of them out, but below is my responses and I'd be grateful to hear what you have to say! I can definitely see Lorescale Coatl as being one of the top removals. He's great cause he get's big in here, fast, and having another option for that as a win-con is helpful. 3 out of the 6 games I've run this so far (heavy on cards) I've pulled off one of my psychological end-games with one opponent surviving and threw Traveler's Cloak on a Mr.Bigs for the final blow. However, I also have Toothy, Skulker, Psychosis Crawler and Tishana herself, so I probably won't need Lorescale. Moving to maybe. Saying that, Bioshift was in case I (likely_ get 1-2 of the 3 counter generators out and either be able to shift them all onto Toothy for a bounce, Skulker before it's removed, or onto something else for a final surprise blow. However, if I'm taking out Lorescale Coatl , Bioshift loses much of that value. Moving to maybe. Vorel of the Hull Clade on the other hand does any kind of counters rather than just +1/+1, which is super potent with either of the Myojins. So much so that he becomes a power-node in the network. Keeping him in means Seahunter also stays as power-node; while I only have 4 merfolk in here, they each play a strong role with a different win-con setup depending on what's happening in the game. One draws me a bunch of cards from having none, one windfalls my hand to the same size for mass card-draw triggers, one flickers Tishana (or other ETB creatures), and the other doubles the counters on the Myojins or Mr.Bigs creatures. To tutor one of these out at any time, directly on to the battlefield for free becomes game winning in many cases. He, like Mirror Image , is one of those creatures that doesn't have great face value, but his place in the network makes him worthy of a spot. Simic Guildmage is a tough one. I'm not entirely convinced on taking Traveler's Cloak out because of the power I've seen it have in many games. Also the other auras are part of infinite combos, but also helpful to get out on non-combo creatures early on, to speed up my board state. I need a way to shift the aura's when one of the other combo pieces hits the ground. It's also great interactivity with the Voltron style some decks in my meta play, and the protection people put on their commanders. I'll keep an eye on him though as I play test this. I'd say he's definitely an option to move to the maybe board. 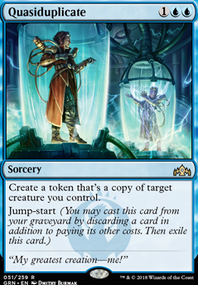 Renewing Touch was in mind as something to restock my deck in a grindy game, to keep me from milling myself and to get all the great utility creatures back. I haven't gotten to a grindy game yet with this, so I think this will make its way to sideboard for now for sure. Same with Boundless Realms , though I do believe it has big power to not just ramp huge, then thin my draws to mainly creatures which I can then play without a problem because of all the mana available. Keep in mind I'm in a slower meta... however, I do also see it for how it lacks value in the more linear, focused gameplay where I'm just trying to get to the win-con. Sideboarding it. Ovinize - I'm worried about lack of removal in this deck and there's players in my meta who us stuff like angels that give all their creatures indestructible or hexproof. This guy seems great for dealing with those things, especially with the help of politicking. On that note, Winged Coatl is also great as, once players in my meta know he's in my deck they talk themselves out of attacking me if I have a few mana up. Or not attacking if he's on the board. In the end, with both of these, I'm worried about not having answers, both to power creatures in others decks, and monsters attacking me when I have a board full of little creatures. I'll try pulling these out and give it a bunch of plays to see what happens, but it's tough. Great call on Deadeye Navigator ! I've been wanting an excuse to pick one of these up and, while I'm worried about his place on the curve, I see his great value and think this deck could handle it in many cases. It's powerful as a repeatable flicker, for sure. 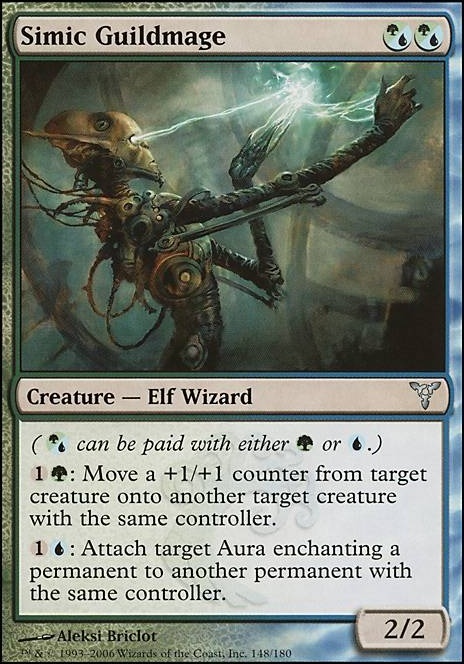 Also, when I was reviewing your Tuvasa of the Eternal Aeon Primer, I noticed Pemmin's Aura which I think could replace Freed from the Real here. It has the same untap ability, but also can make the creature flying which gives it double duty as more evasion for one of the Mr.Bigs. What do you think? Here would be the ten cards I recommend cutting! All the cards listed above doesn't go with tthe theme in the deck or too little of a current synergy that you can go remove all the +1/+1 side theme going on. you are not, at least not in the description of the dec, working with Estrids -1 ability. Any comment on this? 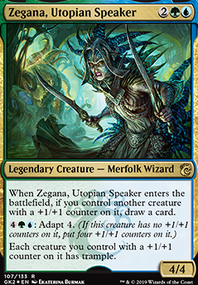 Also, whats your opinion using Simic Guildmage for protection of you permanents and also Estrid herself from removal. Wont be affected with her getting to 0 loyalty. OK, consider the following changes. Obviously you'll need to consider the budget you want to keep with this deck. I'm looking at options to bring up the kill speed for this deck. If you really want to hit hard and hit fast, then you need not worry about you own life total early in the game. I know what you're going for in this deck and I think you should look at this dekc from a different perspective. I'm not talking about play styles. I'm working with your aggressive beatdown style. I'm talking about shifting strategies in mid-game. In the early game you go all-out and hit as hard and fast as possible. Get the kill by turn 4 or 5. Once you've taken out the primary threat, you shift strategies. Change your approach and work on recovery and defense, shift to a midrange gameplay. Ditch that crappy Putrefax. The "sacrifice at the end step" is too much of a hinderance for 5 mana. It it were cheaper, maybe, but nope it is just crap. I really like Elesh Norn, Grand Cenobite but the mana cost is too high for the early game. Not sure on this one. I also think you should reconsider keeping the Lost Leonin since he's cheap and hits the field early. He's also a great pump target. Relic Putrescence - screw your mana rock. Invigorate - Because we don't care what their life total is. Snake Cult Initiation - 3 poison counters at once. Giant Growth, Mutagenic Growth, Titanic Growth, Might of Old Krosa - The classic pump tactic. Azorius Guildmage - Because screw your activated ability. Counter a planeswalker ability and watch the looks on their face. 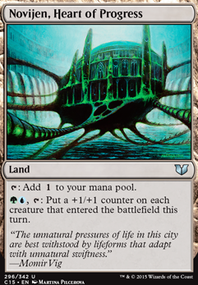 Simic Guildmage - Imagine moving the Rancor or Phyresis after blockers have been declared but before the damage phase. Prowling Serpopard - Nope, I'm gonna get my creatures. Melira, Sylvok Outcast - Make the game one-sided. Lightning Greaves - An additional set of Swiftfoot Boots. Yeah, I know shroud means that you can't pump, but there are ways around that. Unburial Rites - Here it comes again. Virulent Wound - Poison and removal. Pistus Strike - Poison and removal. There are some -1/-1 counters decks based around Hapatra or Atraxa. Since the infect creatures deal combat damage as whither, we can use that to our advantage. Hapatra, Vizier of Poisons - Put those -1 counters on opponent's creatures to work making tokens. Phyrexian Hydra - This gets just stupid with Hapatra, Vizier of Poisons. I know we've talked about this in the past, but I think you should really consider getting the shock lands. A quick check of the card prices on TCGPlayer puts the shocks at about @10-15 each. Totally worth it. Vault of the Archangel - Need to stay in the game a bit longer. Boseiju, Who Shelters All - Screw your counterspell. Ok, so I replaced Armorcraft Judge with Inspiring Call. It serves mostly the same purpose, but is 1 mana cheaper (yay) and doesn't give you a 3/3 creature (nah, it doesn't actually change much in this deck). 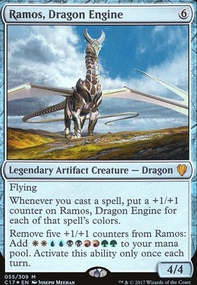 I also replaced Cloudfin Raptor (an ok counter generator thanks to Simic Guildmage) with Hardened Scales. Avatar of the Resolute is nice, but I wouldn't replace anything other with this card. Servant of the Scale IMO doesn't really fit into this deck. If cast before Master Biomancer it doesn't do much, and otherwise I generally don't want my creatures buffed with 4 or so +1/+1 tokens to die. Added two general "perfect scenarios"